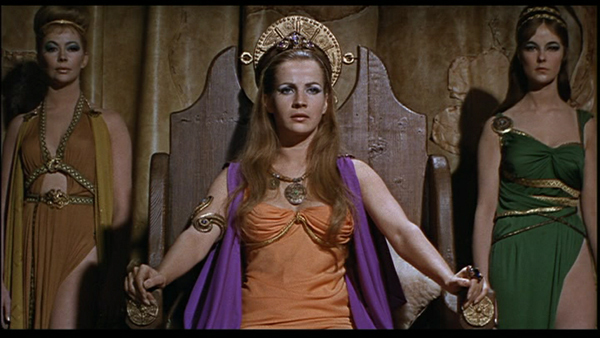 THE VIKING QUEEN—–Merry Olde England, back when t’warn’t so merrie, in the first century after Christ. The Romans have move in, led by….Don Murray? Some of the simple folk are willing to live in peace with the conquerors, but those accursed witch-worshipping Druids are bound on spilling as much red vino as viewers require to stay awake. Mind if we hang out for a few hundred years? Despite action in abundance, and nice color, this saga crucially lacks excitement and sweep. A slew of good Briton supporting players are on view, but to no avail, as the potential for a colorful adventure is quickly dissapated via lackluster scripting and Don Chaffey’s dispirited direction. The Dull Ages. From 1967, weighing in at 91 minutes, peopled by Carita, Donald Houston, Adrienne Corri, Niall MacGinnis, Wilfrid Lawson, Percy Herbert. Read some of Bernard Cornwall’s great ‘Saxon’ novels instead. “See” the preview below! Donald Houston, who five centuries earlier tried to reason with the Spartans.